For a fast and accurate title search, Bethesda, MD buyers trust Eastern Title and Settlement. With more than 20 years of combined industry experience, our team knows everything there is to know about modern title searches. Say goodbye to visiting your local county clerk’s office and waiting hours for someone to track down a title by hand. Eastern Title and Settlement makes public record title searches easy, convenient, and cost-effective. If a comprehensive title search is what you’re after, come to Eastern Title and Settlement. We can search for and examine a chain of title so you can purchase property in confidence. Contact our team to start your title search today. What Does a Title Search in Bethesda, MD Involve? If this is your first title search in Bethesda, MD, have no fear. 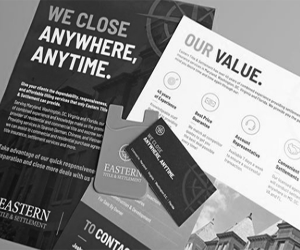 The experts at Eastern Title and Settlement are here to walk you through the process. The goal of a title search is to make sure that a history of a piece of property checks out. In other words, that it doesn’t have any ownership problems, boundary line disputes, easements, encumbrances, liens, unknown heirs, use restrictions, or other issues that could interfere with a real estate transaction. A thorough title search will come up with a full, detailed history of the property’s line of ownership, claims, construction, and more. Since these are matters of public record, they are searchable with the right tools. Some information is available as data found online, while others may only exist in hard copy format in a physical public record bank. A title company like Eastern Title and Settlement can locate and assess all property-related documents for you during a professional title search. It’s important to invest in a title search before investing in a piece of property. Otherwise, you could be purchasing a problem property or money pit without realizing. The more research you do into the history of the house, the better. When you purchase a title search through us, all you need to do is give us a few basic details about the property. We’ll take care of the rest to determine the legal condition of your desired residential or commercial real estate investment. Browse all our services to see how else we can help! Unless you invest in a title search in Bethesda, MD before purchase, you might go through with a real estate transaction only to discover that the “owner” who sold you the house didn’t own the property at all. The easiest and most effective way to prevent major problems is to partner with a company like Eastern Title and Settlement for a trustworthy title search. Eastern Title and Settlement can quickly and easily handle your requested title search in Maryland. We have the data banks, resources, and search methods to come up with virtually all available data on a home, commercial building, or piece of land. We are your one-stop source for everything there is to know about a prospective real estate investment. Learn more about us! Use a title search to calculate the value of a property, offer a more reasonable amount, negotiate with a seller, and rest easy knowing it has no hidden pitfalls. To request a title search, Bethesda, MD residents can contact Eastern Title and Settlement at (240) 403-1285 today.